Over the last two seasons, among 32 qualifying quarterbacks, Cam Newton ranked first in rushing attempts per game, 25th in passing yards per game, 30th in passer rating, and fifth in total fantasy points. Over the final 10 weeks of last season, among 28 qualifying quarterbacks, Newton ranked first in rushing attempts per game, 26th in passing yards per game, 26th in passer rating, and third in total fantasy points. The question now is, “How important is rushing production from a fantasy quarterback?” These two cherry-picked stats seem to imply it’s very important, or at least important enough to help mask a quarterback’s limitations as a passer. Indeed, I think that is exactly the case. It’s rare to find a true dual-threat quarterback starting in the NFL, but the quarterbacks who do qualify tend to be among fantasy’s most productive. This is a concept I first became familiar with in 2013, when Rich Hribar informed us that especially mobile quarterbacks are basically a cheat code in fantasy football. It makes sense a priori as well, with rushing yards being worth 2.5 times as much as passing yards, and rushing touchdowns being worth 1.5 times as much as passing touchdowns. Re-examining Hribar’s work, by a similar methodology, I can confirm his initial thesis. Since the NFL merger (1970), there have been 76 instances of a quarterback playing in at least eight games and averaging at least 5.0 rushing attempts per game in a single season. (Newton has reached this benchmark in every year of his career.) Among these 76 quarterback seasons, the average fantasy point per game total is 17.9 and the average passer rating is 83.2. For comparison, among all quarterbacks to play in at least eight games last season, 17.9 fantasy points per game would have ranked sixth-best overall (of 31 qualifying quarterbacks), while an 83.2 passer rating would have ranked 20th. The implication here is that if a quarterback can hit our threshold of 5.0 rushing attempts per game (a feat accomplished 22 times over the past five seasons), there’s a good chance he can put up strong QB1 numbers without having to be especially efficient as a passer. 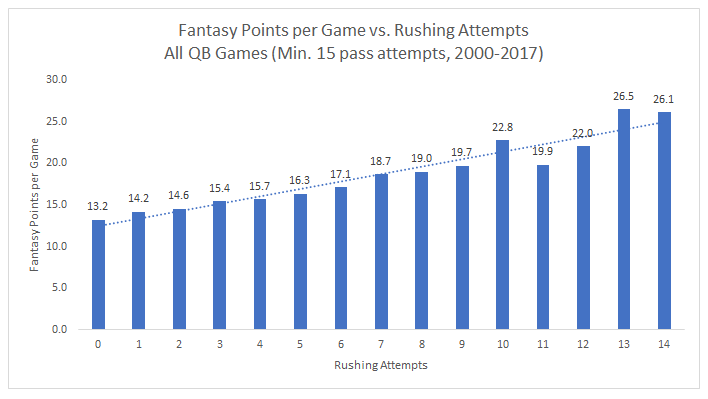 To better illustrate the importance of raw rushing volume, below is a chart contrasting quarterback fantasy points with quarterback rushing attempts in all games since 2000. To add more clarity on the two statistics that started off this article, since Newton entered the league in 2011, he leads all quarterbacks in rushing attempts by 250. Basically, true dual-threat quarterbacks are rare, and Newton, especially, is something of a unicorn. That being said, I think this draft class offers one quarterback who might have as much rushing upside and fantasy potential as Newton. Louisville’s Lamar Jackson averaged over 120.0 rushing yards per game in 2016 and 2017, which is a feat that has only been accomplished four other times since 2000. Throughout his college career, Lamar Jackson has averaged 108.7 rushing yards per game, or, the most by any Power-5 quarterback since (at least) 2000. Although Jackson has the second-lowest NCAA passer rating on this list, he paces everyone else in all measures of rushing production. Based on this chart, we can run a very basic projection for what Jackson’s rushing production might look like in the NFL. On average, these quarterbacks see a decline in rushing attempts per game by 59 percent, rushing yards per game by 59 percent, and rushing touchdowns per game by 72 percent. In Jackson’s case, that would mean he would average about 10.2 rushing attempts per game, 64.2 rushing yards per game, 0.9 rushing touchdowns per game, and 12.1 rushing fantasy points per game at the NFL level. Last season, the 12th-highest-scoring quarterback averaged 17.6 fantasy points per game. Essentially, if our projections are right, Jackson would only need about 140 passing yards per game (and zero passing touchdowns) to hit QB1 numbers. Of course, this is a very elementary method of projecting production from the college to the NFL level, but the point still stands. If drafted to a team prepared to start him in year one, and unafraid to stay committed to his talents on the ground, I’d feel confident taking Jackson in the high-end QB2 range of my fantasy drafts, despite the inexperience and general accuracy concerns.